I can't say I'm a big fan of the Academy Awards. I enjoy watching a good movie as much as the next person, but the televised awards show has gotten dreadfully bad. This year's edition was another new low, it seems to me. But never mind. Of course, distractions can be a welcome thing and spending Sunday afternoon on the Brewvana bus was nearly perfect as distractions go. There were four tour stops, each illuminating in its own way. 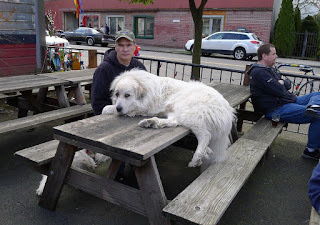 You know Brewvana Tours if you hang out in or on the fringe of the Portland beer scene. The little magic buses (Angel and Rose) can be seen carting beer fans between breweries and events in Beervana and beyond. These guys are your ticket to discovering the local and state beer scene. 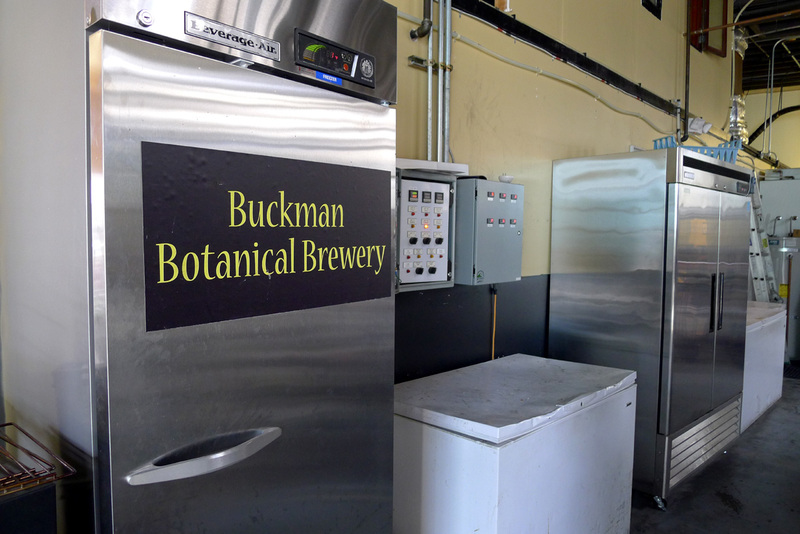 Sunday's tour kicked off at Buckman Botanical Brewery, located inside the Green Dragon. Head (and only brewer) Brewer Danny Connors showed us the ropes of his little brewery and explained what he's up to. He essentially uses minimal hops in the creation of his beers...and mostly in the boil for mild bitterness. To achieve flavor and aroma, he uses a variety of things other than hops at the end of the boil...orange peel, ginger, apple juice, etc. We tasted several Buckman beers. They are a fairly interesting lot, all vaguely experimental. The consensus seemed to favor the Ginger Ale...not quite the same as the Canada Dry version. The ones with apple and orange were also pretty good. These beers aren't going to be your thing if you like hoppy, but I suggest beer cocktail connoisseurs take note. The Buckman tasting concluded with Brutal IPA, a Rogue standard and palette cleanser. Our next stop was Amnesia Brewing on Mississippi. There wasn't quite enough sun for the outdoor area to be packed the way it will be once the warm weather returns, but it was busy enough. We worked our way through several pitchers...Dusty Trail Pale Ale, ESB, Porter and Desolation IPA. All good beers I've had a time or two before. On the subject of Amnesia, their website says the new production brewery and tasting room in Washougal is now open. There was some suggestion on the bus that they were not yet open, but a quick call to Washougal verified that they are indeed open up there. Time for a short road trip, it seems. 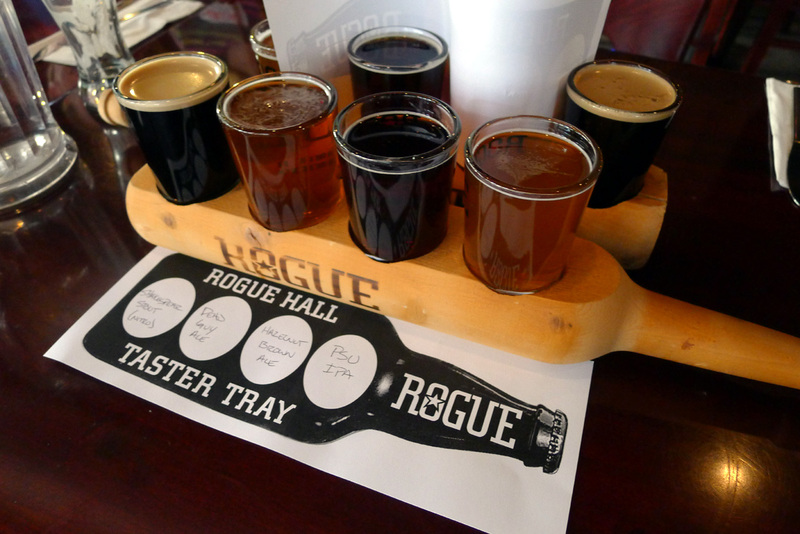 Next up was Rogue Hall, in the heart of Portland State University. I'd never been to this place before. It's pleasantly warm and friendly. Lunch was served here and it was really good. 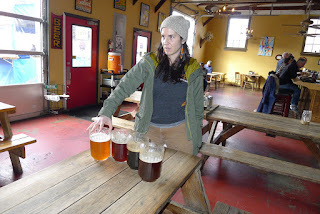 Beer tasters were already on the table when we walked in and included Shakespeare Oatmeal Stout, Dead Guy Ale, Hazelnut Brown Ale and PSU IPA. I think palettes, including my own, were pretty mangled at this point. And the food didn't really help. I did like the stout, which was on nitro and damn smooth. Otherwise, the beers seemed to run together...and that normally would not be the case. Our final stop was Hair of the Dog Brewing. The Dog's old world big ales may not have been exactly what we needed on our last stop, but this place is always fun to visit. We were served tasters of Greg, Fred, Adam and Blue Dot IPA. Each of these beers is terrific in its own way, although I'm not sure they go together very well as a tasting flight. But never mind. All in all, it was a fun little tour and a good time was had by all riders. 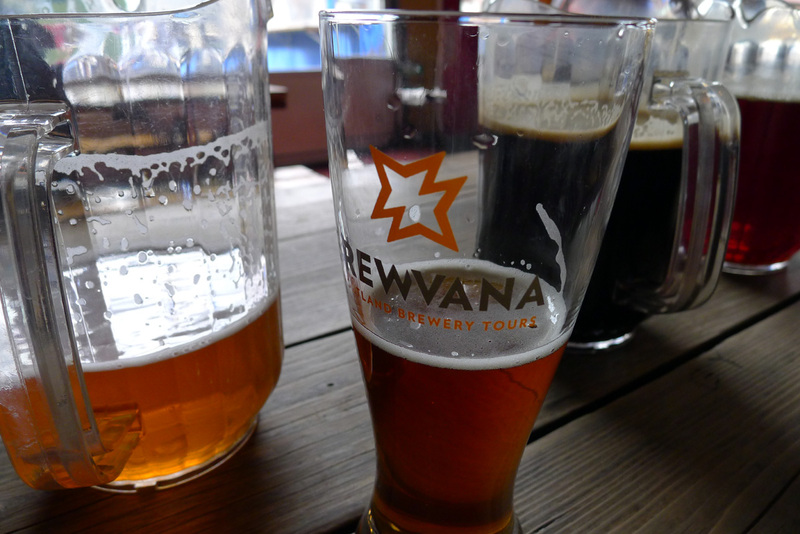 The Brewvana folks have a variety of tours to choose from and there's something for everyone. Trust me on that. As they like to say, Hop on the Bus! Full disclosure: From time to time, Brewvana offers complimentary rides to members of the beer media. That was the case on this tour. Thanks for the ride, kids!